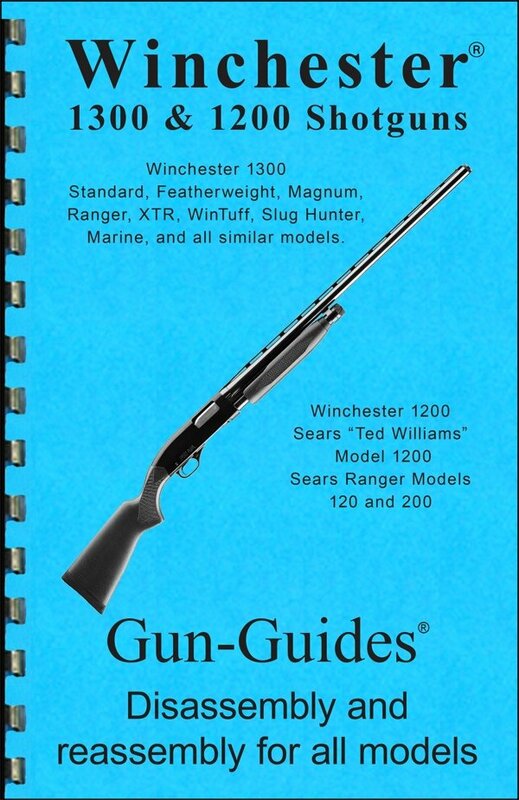 Winchester 1300, Standard, Featherweight, Magnum, Ranger, Pistol Grip, Camo, Deer, Combo, XTR, WinTuff, Slug Hunter, Marine, and all similar models. Winchester 1200 Sears “Ted Williams” Model 1200 Sears Ranger Models, 120 and 200. • 16 pages & 35+ high-resolution grayscale images. No pump shotgun is faster than the Winchester Model 1300. Winchester in 1964. Please see similar models listed on the back cover. Historical timeline of the Model 1300. 1978: Model 1300 pump shotgun introduced. 1984: 1300 Featherweight pump shotgun, 12 ga., 20 ga and	pistol grip models. 1985: Magnum Waterfowl and Ranger youth slide action. 1987: Model 1300 Camo Pack 22” and 30” barrels, Ranger Deer combination pack. 1988 Model 1300 Wild Turkey Federation “Gun of the Year”, XTR 28” barrel, Featherweight 22” barrel, and WinTuffs. 1990: Slug Hunter, 28” & 26” barrels, Stainless Marine, Ranger 26”, and 20 gauge Defender. 1997: Model 1300 Lady Defender 8 shot 20 gauge. Company (the company that makes Winchester the Model 1300 Speed Pump Shotgun) would be shutting down the factory located in New Haven, Connecticut.